The high-end EE310 and EE360 industrial transmitters from E+E Elektronik are now available with stainless steel or with polycarbonate enclosure. The EE310 humidity and temperature transmitter is dedicated for demanding industrial processes control. The EE360 measures the moisture content of industrial oils and thus enables predictive maintenance of machines and plants. Both devices feature an optional 3.5" TFT color display, which offers an optimal view of the measured values and facilitates the commissioning and configuration. The built-in data logger can save 20,000 values per measurand. The recorded data can be displayed as a graph directly on the display or downloaded via USB interface for further analysis. The measured data is available on two analogue outputs and on the optional digital interface (RS485 with Modbus RTU or Ethernet with Modbus TCP). An optional relay module can be used for alarms and process control. The enclosure design facilitates installation and maintenance. The front cover, which accommodates the electronics and the probe, can be replaced within seconds, while the wiring inside the back cover remains intact. The EE310 measures relative humidity and temperature in the range -40 °C…180 °C ( 40...356 °F) and calculates further physical quantities such as dew point temperature, absolute humidity or mixing ratio. 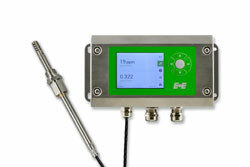 The transmitter is available for duct or wall mount, as well as with remote probes. The EE360 measures water activity and temperature and calculates the absolute water content of transformer, lubrication and hydraulic oil, as well as of diesel fuel. The sensing probe can be employed up to 180 °C (356 °F) and 20 bar (290 psi). The ISO or NPT slide fitting and the optional ball valve facilitate the installation.